SumoBoy is the world’s first mini sumo robotics kit that consists of two parts: a programmable fight robot & the prototyping board set. 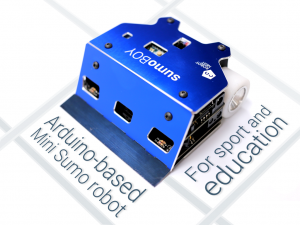 A team of robotics experts and champions has come together to create the world’s first mini sumo robotics kit and has launched a campaign to raise money for mass production. It’s becoming more and more obvious that at least basic programming skills will be essential for future professionals in almost all fields of work. That’s why SumoBoy team wants to send a message to the youth that electronics, programming and engineering can be a fun and exciting path to choose even for complete beginners! Robot sumo is a sport, where two robots attempt to push each other out of a ring (in a similar fashion to the sport of sumo). The competing robots are called sumobots. The main challenge and the excitement lies within their autonomy – they are not remotely controlled during the battle. Till now all the competing teams or individual enthusiasts were left alone with their robots, which was a real frustration for those whose skills were more on the software side while more hardware oriented builders were programming during the last night. SumoBoy team has come up with the world’s first professional mini sumobot that is already assembled and complies with the industry standards to some extent saving hardware issues to software guys and making it easier to program for hardware guys. The robot kit combines best practice of the sumo team with long track of wins in major competitions worldwide and the best materials available for reasonable price. The SumoBoy uses the well-known Arduino microcontroller that can be programmed either in C or C++ to successfully execute the winning strategy. However SumoBoy Kickstarter Kit is more than just a fight robot. While robot itself is intended for tournaments, we have also included the prototyping board that serves as a perfect platform for learning fundamentals of electronics and programming. Over the years of making robots and organizing youth workshops, we have gained a lot of experience and insights into what should make the essential sumo-robot experience for both – beginners and experts. That’s why we decided to place equal emphasis on both – the competitive and educational aspects of sumo robotics. Using the prototyping board everyone can play around with dozens of components, combine them into numerous algorithms and learn how to program to run their fun projects. We have also written an extensive book explaining basics of electronics behind the sumo robotics, which will be available for free on our website. Book will be extended and complemented over the next few years to address specific topics even from simple AI with increasing complexity. SumoBoy team having an extensive experience with youth workshops has made the whole learning process as easy as possible. Just remove the Arduino micro controller from the robot, plug it into prototyping board and you are ready to start learning. 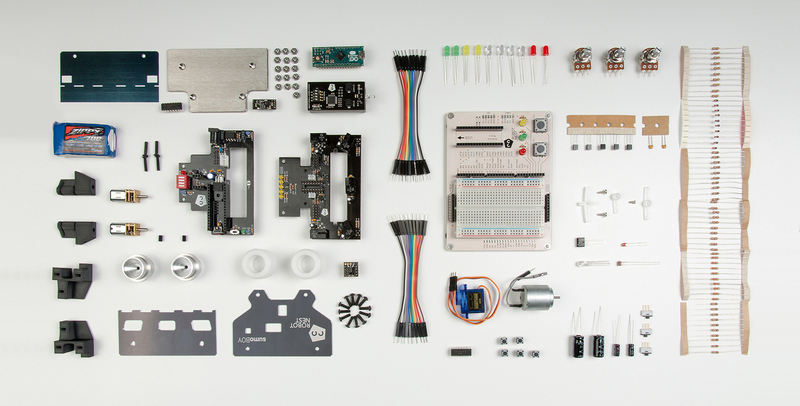 We selected only the highest quality components for our learning set and removed the need for risky soldering process, which limits the possible reuse of the components from one project to another. components, place them in the correct spots, connect the board to a PC or laptop via USB cable and you are ready to start programming. Arduino micro controller uses adapted C and C ++ programming languages, which are widely used in many real life applications, ranging from videogames to consumer electronics. 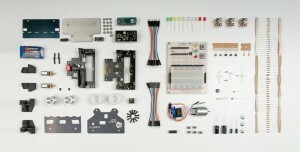 SumoBoy Kit includes a power supply, USB cable, set of electronic components comprising sensors, resistors, capacitors, transistors, wires, LED’s, motors, high quality screwdriver and the Mini Sumo Robot together with a cardboard dummy that serves as the opponent when testing the robot in action. We have tried out this kit many times in different robotics hobby groups along with electronics enthusiasts and made sure this kit embodies the best mini sumo-robot experience you can get! VIDEO: What is SumoBoy and what it is capable of? Our Goal is to Kickstart hundreds of new sumo-robot communities all around the world. To push the competition to the next level by introducing new crowds to the scene. And to send a message to the youth that programming and electronics engineering can be fun and exciting path to choose. In order to achieve those goals, we need a 100 000 USD to start a mass production of our robot kits.